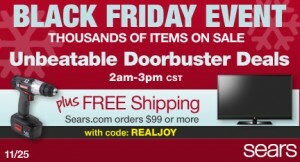 Sears Black Friday Deals | DaDa Rocks! This year the wife and I are really hoping to get a super large LED HDTV that I can mount to the wall… I am hoping to see a really good deal on them for Black Friday. I guess I should say I’m hoping to get the TV, my wife really just wants me to get hide all the wires. Sears will offer customers more than 900 doorbuster deals and provide Shop Your Way Rewards Members with exclusive coupons and offers. Sears has one awesome promotion. The day before Black Friday, Sears shoppers have the opportunity to purchase items in the Black Friday circular online before they can get in the store. Beginning on Black Friday, customers will also be able to pick up a Sears Real Deal Coupon Book (while supplies last) for more than $3,000 worth of savings storewide throughout the holiday shopping season. Customers can use the coupons starting on Saturday, Nov. 27 to save on their holiday shopping. Customers do not have to wait until Black Friday to save. Circulars for Sears deals are available weeks in advance on searslocalad.com, which provides real deals in real-time from local Sears stores using frequent inventory updates and access to ads 24 hours a day. Plus, shoppers can take advantage of services such as Buy Online, Pick Up In-Store, ship-to-store and free shipping options. Once again I’m part of the Sears Holiday Blogger Program I will be compensated for my posts as well as received gift cards. All opinions are my own.